Traditional retailers have felt the push and pull of consumers’ changing shopping behavior since the dawn of online shopping more than twenty years ago. From electronics stores to drugstores, the classic retail setup featuring aisle after aisle of merchandise populated by eager sales associates leading to a battery of cash registers is outdated. Today’s customer expects more, and cannabis is no exception: to bridge the distance between online and brick-and-mortar through a seamless shopping experience. 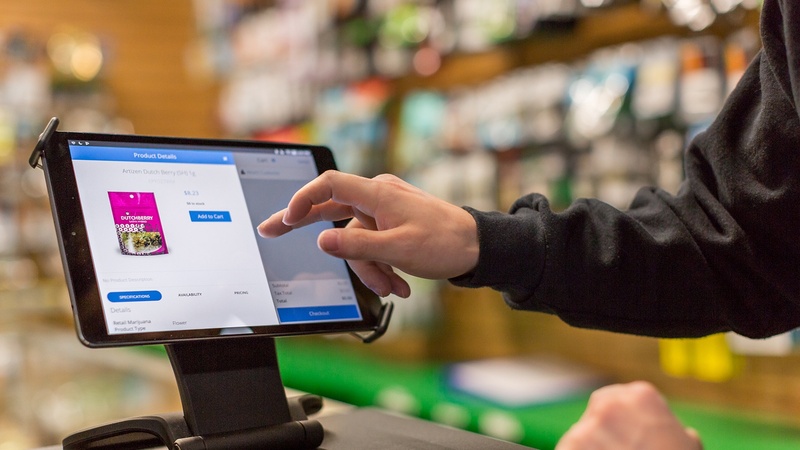 For cannabis retailers, being able to adapt quickly to this new normal is key, and in today’s post, we describe how omnichannel retailing can help your dispensary exceed consumer expectations. Omnichannel retailing is a term that describes a complete integration of the online and offline retail experience. This approach to commerce makes integrations across website, marketing, store inventory and point-of-sale possible, resulting in a consistent brand experience across all touchpoints. For a cannabis retail store, omnichannel retailing might look like this: a consumer visits the store website to find a specific strain in stock. She knows what she wants and doesn’t need an involved conversation with a budtender, so she places an order for the product online before visiting the store. When the consumer arrives, she is able to completely bypass the primary line by paying for and picking up her order from the online pick-up counter. Research shows that consumers who use four or more channels spend 9 percent more in store on average than those who only use one channel. On the blog, we share three benefits to omnichannel retailing at your cannabis store. Reportedly 83 percent of shoppers use their smartphones while they’re in a retail store for everything from comparing prices to seeking out promotions. Incorporating digital technology into your dispensary design is a simple way to enable consumers to do what already feels natural to them. Not every consumer needs time with a budtender, and digital store signage and interactive touchscreen menus provide consumers with the convenience of being able to access product information on their own. Few things are as disappointing to a consumer than seeing their favorite edible as in stock on your website, only to visit the store and learn at the cash wrap that the product is sold out. With omnichannel retailing, consumers have round-the-clock access to the most updated product selection and inventories. Tools like electronic menus can be updated automatically, so whether the consumer is accessing the menu online, browsing independently at a self-serve kiosk in the dispensary, or viewing it on a tablet with the assistance of a budtender, they are seeing consistent, reliable information. A successful omnichannel retail strategy goes a long way towards providing consumers with the best shopping experience possible. The creative merchandising that’s possible with using cannabis touchscreen menus means consumers are able to navigate your store’s inventory in myriad ways – from selecting strains based on their individual symptoms to sorting the dispensary’s selection of CBD products by price. Touchscreen menus can also be used to show consumers products and accessories that complement the product they want – like a branded stash jar for their selected strain – making upselling even easier. Cova has remained at the forefront of omnichannel retailing, having armed its retail clients with such features as Reserve Online, Pick Up In-Store and Express Checkout. Now Cova and leading cannabis information resource Leafly have created an integration partnership to provide accurate updates to cannabis retailers in real time. With this new integration, dispensaries can automatically sync their online menus instead of having to make updates manually. This ensures that inventory and pricing are accurately reflected across all channels, eliminating the possibility that a product shows in-stock online when it’s actually sold out. With the integration, cannabis retail owners will be able to deliver to consumers the ultimate cannabis retail omnichannel experience. Contact our team to learn more about this new partnership.